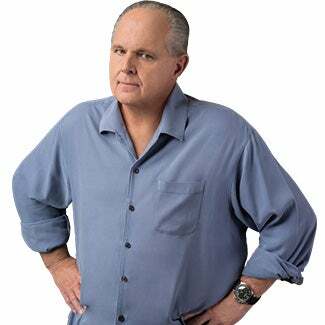 RUSH: In the last week, ladies and gentlemen, the past week, the United States of America Drive-By Media has spent more time trashing the United States Commander-in-Chief than they have the crazy, lunatic dictator who starves his people and has threatened to drop nukes on the United States. The Drive-By Media has spent more time criticizing and trashing and questioning the fitness for office of Donald Trump than they have the pot-bellied, ludicrous, weird haircut dictator of North Korea. Just think about that, just pause for a moment. Let’s pause for a moment and think, remember politics used to end at the water’s edge. Democrats, of course, blew that sky high during the Iraq War. They are still so poisoned with hatred for Trump winning that they are trying to persuade Americans to line up against their own president in favor of a 32-year-old lunatic with ICBMs at his disposal in North Korea. It’s mindboggling, just on the surface, the coverage of the news all week. We have to be nice to Kim Jong-un. We must not provoke Kim Jong-un. He must be reasoned with. Trump is dangerously unfit, dangerously insane, dangerously out of balance, out of kilter. We must do what we can to stop Trump. It is obscene, the poison of hatred flowing through their veins. The damage is easy to see. RUSH: Mike in Plant City, Florida, I appreciate your waiting. How are you doing? CALLER: I’m great, Rush. It’s such an honor to talk to you, and I can’t believe I get to say this: Mega dittos from a nervous, first-time 20-year caller. RUSH: Appreciate you calling. I really do. Thank you. CALLER: Thanks for all you do. I was calling in because I was on my way during lunch and I got to listen to one of our senators here from Florida pretty much just berating Donald Trump for standing up and tweeting and the rhetoric and all the bad stuff he’s saying and all the trouble he’s causing, and this has to be worked out with diplomatic approach. Our great Senator Bill Nelson, if you want to call him that. I’m just so sick and tired of these wannabe people in government just ignoring us and ignoring why we put the people in there we do. And it gets very frustrating and very disappointing, and it’s hard to deal with, you know? They’re just reading from the party talking points that are sent out to all of them. I’ll tell you, I think we’re at a point here where we’re seeing, we’re witnessing, it’s being demonstrated for us, liberalism is not sustainable. At some point it’s going to implode on itself and we’re watching that happen right now. Now, don’t anybody misunderstand me. I’m not saying that they’ve lost their influence or anything of the sort. I’m just telling you, more and more people, average ordinary people, low-information people are starting to pick up on this now and starting to realize it. And as I said, I don’t want to be misunderstood. I’m not claiming that we’ve crossed a threshold here. But the behavior of Trump’s opponents is what’s odd and delusional and deranged. It’s just dangerous. Portraying the North Korean dictator as the stable part of this equation and that Trump represents the threat, it’s the result, I think, of so much poison. They really poisoned themselves with hatred. And they’ve done so purposefully and happily. Hate is just pouring through every crevice, every vein, every artery to the point it now can’t be covered up or hidden.